About a year ago I wrote about how fortunate Cave Creek was to have landed PGA golfer Tom Lehman as the new owner of Carolyn Fabrici’s former estate of about 100 acres on Honda Bow Road in north Cave Creek. Before the state, county and Cave Creek bought Spur Cross Ranch (SCR) in 2000 some of SCR and properties a little south of Morning Star Road were in Maricopa County, not Cave Creek. Town of Cave Creek administration believed annexation of the property would help get the votes to save SCR from the developer planning a golf course and residential subdivision. Fabrici’s lawyer drafted the 25-year annexation agreement and citizens voted to join Cave Creek. It was a difficult vote since the county had the reputation of less red tape and fewer restrictions. For example, Jerry Foster the legendary helicopter pilot, who worked for Channel 12, voted no. 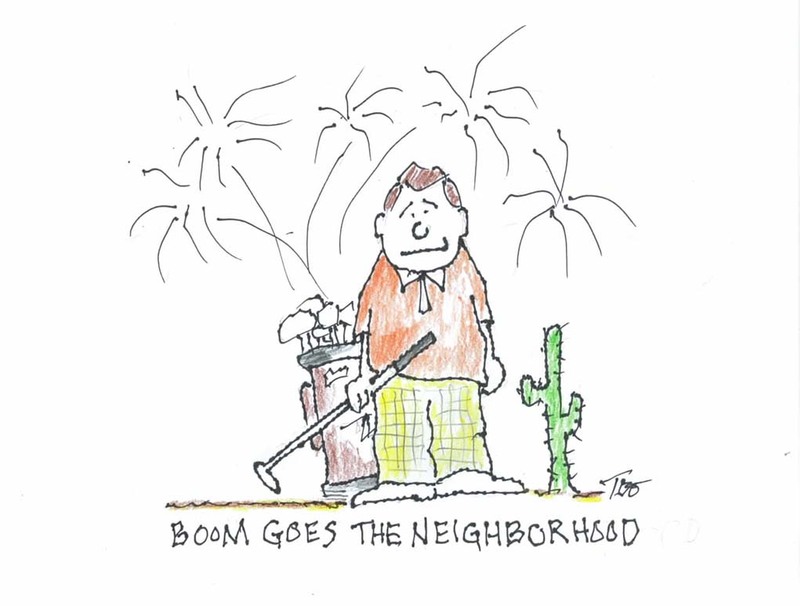 I now live where Jerry lived then and Tom Lehman lives across Cave Creek (the actual creek) northeast of me. I have a bird’s eye view of the south side of the Lehman estate. When he first moved in he met with neighbors and spoke of his plans for the property, which his neighbors quickly misconstrued and the rumors began. Neighbors claimed he was putting in a grass putting green which would use excessive ground water. Actually the green is artificial turf. They claimed he was building a golf course; he wasn’t. Many of the same critics want to add twenty five years to the existing 25-year restrictions on the annexation properties. I have never met Tom Lehman but spoke to him on the phone when the flak started. We had a pleasant and frank conversation. I have seen him play golf on the PGA Senior Tour and he is outstanding. Recently, Tom’s critics had another reason to complain. When he spoke to citizens before, he told them he would remain in Scottsdale for the next 5 years before he would occupy his estate. Earlier this year he made it clear one of two daughters would marry this year. All necessary members of town staff were informed the wedding would take place on the Lehman estate and it was approved, including approval by Rural/Metro Fire Chief John Kraetz. Why Kratetz? Because they planned about ten minutes of fireworks near the site where the wedding event took place. From my view there was a setup of chairs and umbrellas on the putting green and a plethora of catering trucks. However, during the next council meeting people showed up that had nothing good to say about the event and one woman even called Mr. Lehman a bully, which is absolutely false. Go online: He has earned his fortune through his athleticism. He is a Christian and family man. His employees build golf courses. He leads a charity to help children with cancer and is involved in at least half a dozen more charitable organizations. Cave Creek is lucky to have a man with his values and his critics need to get a life.